Spend the day at Bali's premier waterpark! 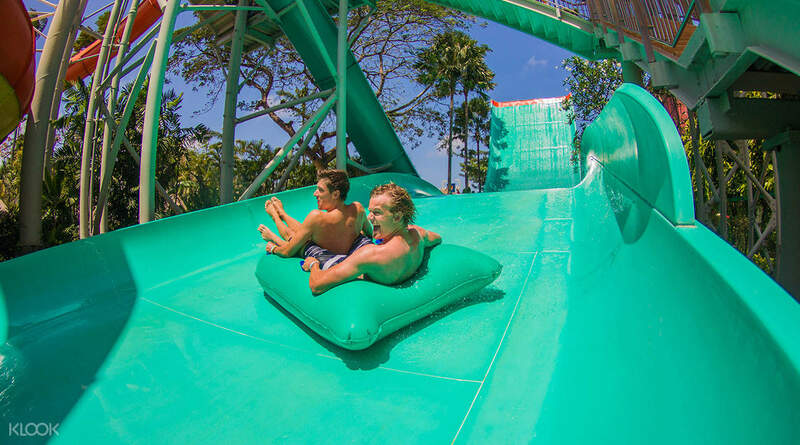 Located in central Kuta, Waterbom is an oasis in the heart of the bustling tourist area and is Bali's most popular waterpark – and for good reason. Featuring numerous thrilling rides and child-friendly attractions, the park has something for everyone. Adults can enjoy massages or a tropical drink at the swim up bar whilst kids can head to the slides and wet play areas. Brave the pride of the park, a 70km/hr ride called Climax. 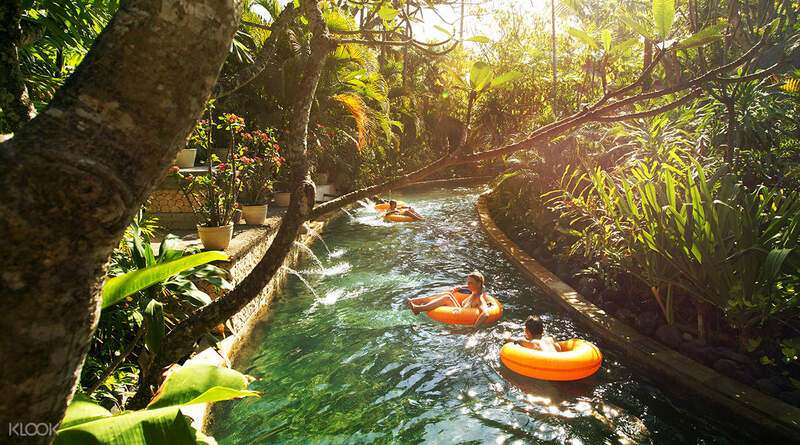 Or for something more chilled, the Lazy River may suit you better. A cashless payment band means you can simply buy your credit, leave all your valuables at the locker room and enjoy all park facilities with a flash of your wrist. You're certain to find more than enough to entertain you for the whole day at what is arguably the biggest and best waterpark in Bali. Bring the whole family to Waterbom Bali! Plenty of attractions for kids of all ages! Waterbom is one of the clean, safe and most responsible in my opinion, would be one of the top ones in world. Lifeguards at every turn of the park. Clean toilets, change rooms & well maintained lockers. Water conservation drive is big in the park. Loved every activity in the park. Cabana is perfect for some mid-day rest after heavy eating. Yes, the restaurants have a great spread. Waterbom is one of the clean, safe and most responsible in my opinion, would be one of the top ones in world. Lifeguards at every turn of the park. Clean toilets, change rooms & well maintained lockers. Water conservation drive is big in the park. Loved every activity in the park. Cabana is perfect for some mid-day rest after heavy eating. Yes, the restaurants have a great spread. Excellent price with Klook as usual. Bali Waterbom is worth the price. Efficient and friendly staff and variety of food places to eat. 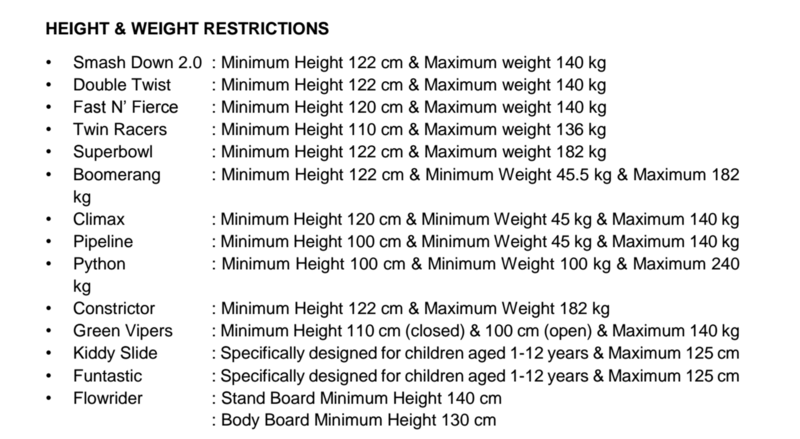 No food and drinks allowed inside the water park. Nice variety of slides to cater for all age groups. Very clean and well maintained. Excellent price with Klook as usual. Bali Waterbom is worth the price. Efficient and friendly staff and variety of food places to eat. No food and drinks allowed inside the water park. Nice variety of slides to cater for all age groups. Very clean and well maintained. Third visit to Waterboom in 2 years and again we're having only positive emotions and experience. The park is still well kept, all rides are in a perfect shape. our 3 years old daughter is already 100 cm and we were finally able to ride some adult rides such as Python together :) child zone is still great with small rides. As always enjoyed a few snacks and pizza nearby child zone (Nasi Goreng was fantastic!). They also added some new tents. Overall still a great place to visit with your family and spend whole day here. highly recommended! actually, best activity in Bali imho. Third visit to Waterboom in 2 years and again we're having only positive emotions and experience. The park is still well kept, all rides are in a perfect shape. our 3 years old daughter is already 100 cm and we were finally able to ride some adult rides such as Python together :) child zone is still great with small rides. As always enjoyed a few snacks and pizza nearby child zone (Nasi Goreng was fantastic!). They also added some new tents. Overall still a great place to visit with your family and spend whole day here. highly recommended! actually, best activity in Bali imho. 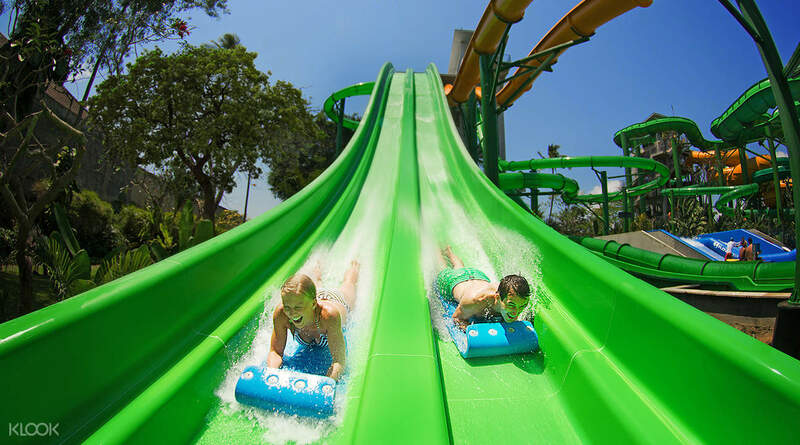 Excellent options for adults and kids to have fun at the water theme park in waterbom Bali. The hits for me was the boomerang and python rides apart from the lazy river on a lazy afternoon! The python ride in a utterly dark slide with my kids was exiting as I hadnt experienced a dark slide before. The ThaiItalian restaurant is a good place to try out local delicacies, if u havent tried Indonesian food. A full coconut is a great way to refresh yourself as u watch adults and kids try out the flow rider! 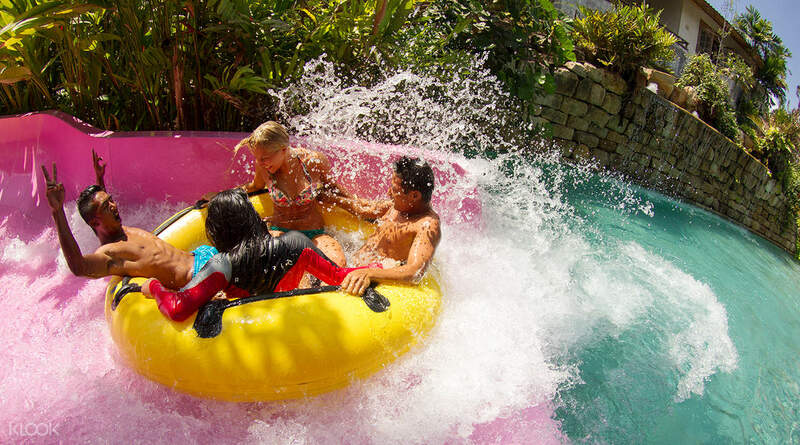 Excellent options for adults and kids to have fun at the water theme park in waterbom Bali. The hits for me was the boomerang and python rides apart from the lazy river on a lazy afternoon! The python ride in a utterly dark slide with my kids was exiting as I hadnt experienced a dark slide before. The ThaiItalian restaurant is a good place to try out local delicacies, if u havent tried Indonesian food. A full coconut is a great way to refresh yourself as u watch adults and kids try out the flow rider! Perfect for a family getaway. Amazing water activities that are worth to try especially for adrenaline junkies. You can also find affordable foods and desserts inside payable with their reloadable waterproof wristband. Perfect for a family getaway. Amazing water activities that are worth to try especially for adrenaline junkies. You can also find affordable foods and desserts inside payable with their reloadable waterproof wristband. Weekdays are the best time to go and check out the place. All the rides are fun but they close at 6pm so you need to get there as early as possible to enjoy your day in the park. I will definitely come back again. Weekdays are the best time to go and check out the place. All the rides are fun but they close at 6pm so you need to get there as early as possible to enjoy your day in the park. I will definitely come back again. Waterbom park never fails to disappoint me. It is worth the money. Booking from Klook allows you to save 10$ as booking from waterbom park will cause you 53$. Photos are pricey and some activities (surfing require cash). Waterbom park never fails to disappoint me. It is worth the money. Booking from Klook allows you to save 10$ as booking from waterbom park will cause you 53$. Photos are pricey and some activities (surfing require cash). The price from klook is even cheaper than buying from the official website online, which also got discount). It was seamless and without hesitation in redeeming the ticket from the office. Will suggest to to others for sure! There are many food choices in the park too! The price from klook is even cheaper than buying from the official website online, which also got discount). It was seamless and without hesitation in redeeming the ticket from the office. Will suggest to to others for sure! There are many food choices in the park too!